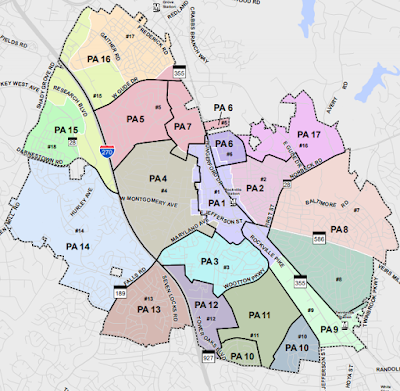 City of Rockville planning staff presented a newly-proposed map dividing the city into 17 new planning areas to the Planning Commission last night at City Hall. 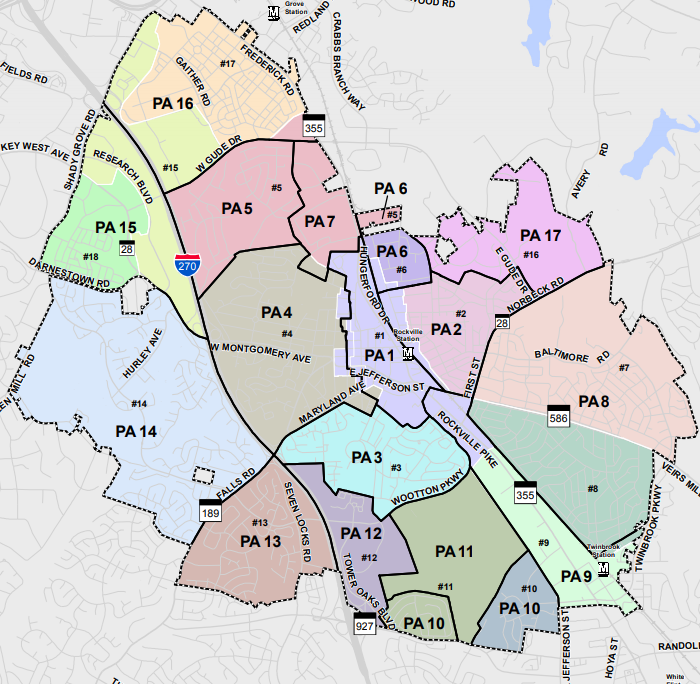 The map is part of the Rockville 2040 Comprehensive Master Plan Update process. Among the new changes are that Stonestreet Avenue has been split and moved into the East Rockville and Lincoln Park areas. The new map will also keep both Twinbrook planning areas together, as they were in the Twinbrook master plan update. Commissioners raised some questions about the accuracy of the nomenclature for some areas. "Woodley Gardens East-West," appearing on the same list as "Woodley Gardens" is "a little confusing," Commissioner Don Hadley noted. The label was apparently based on a separate subdivision name for part of the area lumped in with the West End. Another concern, addressed by Hadley and Commissioner Charles Littlefield, was the lack of consideration of borders between conflicting land uses, such as residential and industrial. How these could be represented on the map, or whether they should be, were topics of debate. One such area, N. Adams Street, has a mix of office and residential uses. That could cause issues if redevelopment occurs along the street, which is a transition area between single-family homes and the Town Center. Chief of Long Range Planning David Levy said the street was discussed by staff and community representatives Tuesday night, including former Rockville Mayor Larry Giammo. Hate the map, or feel your neighborhood wasn't heard in the process? Planning staff will be meeting with all neighborhoods to discuss the proposed planning area boundaries in the coming months.